On the Dashboard, you will see "APP CENTRE" menu and under it, you will find "Customer Previous Ticket Listing". Click on that button and Customer Previous Ticket Listing App will get installed. Alternately, for uninstalling the app, go to Customer Previous Ticket Listing "Overview" section then click on Uninstall button. Now, the support staff can go to ticket view page and they can see Customer Previous Ticket Listing icon on the top right side. When the agent will click on the icon, then a list of different tickets raised by the same client will be listed. 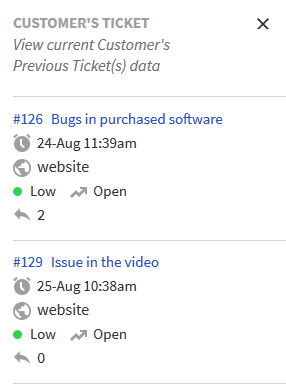 Details like TimeStamp, Channel, Priority, Status, Total Replies, Ticket ID and Ticket title will be displayed.